A National Historic Landmark, Eleutherian College was constructed between 1854 and 1856, and was the first college in Indiana to admit students without regard to race or gender. Some of the college's trustees were among the most active participants in the Underground Railroad in and around Lancaster. 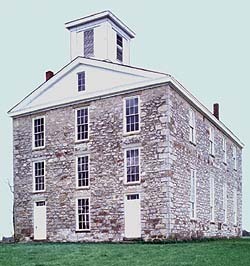 From the Greek Eleutheros' meaning "freedom and equality," the school embodied its founders antislavery sentiments, and the school's location, atop the highest hill in the area, was a physical and symbolic statement of the community's beliefs. 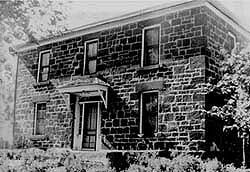 Continuing to operate as a private, coeducational secondary school until the mid-1880s, the college was purchased by Lancaster Township in 1888 and used as a public school until 1938. Today, Eleutherian College Classroom and Chapel Building stands vacant. Lancaster was a known stop for fugitive slaves traveling from Madison, Indiana to Indianapolis. Three of Eleutherian's trustees, Samuel Tibbetts, Lyman Hoyt, and James Nelson, were frequently mentioned in connection with the Underground Railroad and its efforts in the vicinity of Lancaster and Madison. James Nelson was arrested by a local sherrif under the Indiana Fugitive Slave Act of 1851 for "encouraging Negroes to come into the state." Judge Stephen C. Stevens, sympathetic to the antislavery cause, had the case thrown out of court. Eleutherian College Classroom and Chapel Building is located on State Route 250, just east of Lancaster. Though currently not open to the public, the building is owned by Historic Eleutherian, Inc. who is seeking funds for a long-range plan for the site.